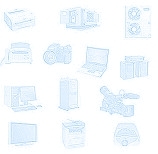 Facilities : Toilets, Urinel, Light, Jet Sprayer and Tisue. The photo above is 2 units of Portable Toilets at the launching event of Rice Seedlings in Cianjur SRI , which was attended by the father of President SBY in Cianjur, West Java. TOILET RENTAL: Picture of the inside of Mobile Toilets stretched before assembly. Consists of toilet, Urinel, Place Tisue, and Jet Sprayer (cleaning water is sprayed). TOILET RENTAL: Portable Toilet Image of the inside, which consists of toilet, Urinel, Place Tisue, and Jet Sprayer (cleaning water is sprayed). 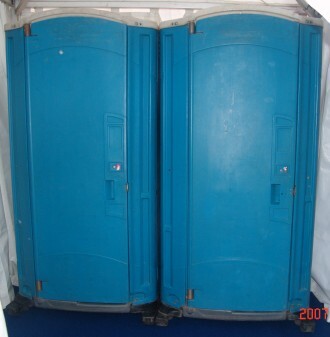 PORTA POTTY RENT : Picture of the inside of the upper Portable Toilets white. TOILET RENTAL: Shown in the picture above, 2 units of portable toilets used at the Joint military exercises with the U.S. Army Infantry PUSDIK Cipatat Rajamandala in West Java. Toilet total amounted to 18 units. Also note, this is the kind we Toilet Portable is not mobile. 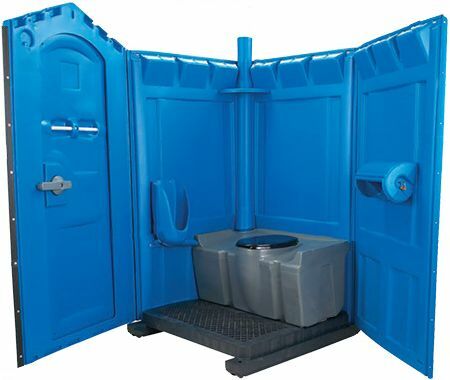 If the Mobile Toilets placement usually placed in a car, while the toilet is more efficient because we do not need a car to its placement so as to put in a difficult place. 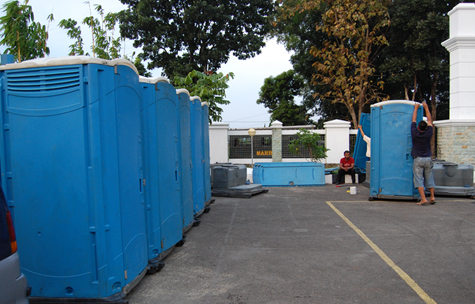 This is a photo Toilet Rental project in the Marine Corps Command Train - Central Jampang Puslatpur Sukabumi, which type of VIP Portable Toilet rental (sitting) as many as 15 units of toilets. Shown in the picture during installation (loading) of goods on site. 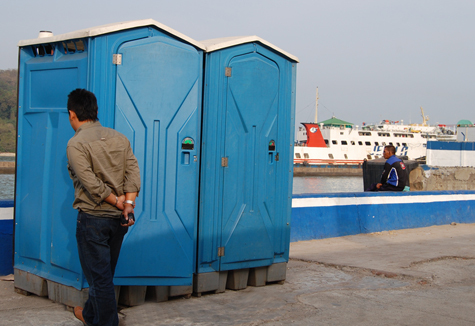 Shown in Figure 2 Trucks transporting vehicles Toilet type Standard (squat) to be placed in Merak Harbor as many as 16 units of toilets, newly arrived on the scene to the next placed at predetermined points. 2 units of 16 units of type Standard Portable Toilets (squat) used in Merak Harbor, a facility for the travelers on the season, going home before Lebaran (H-) and flows back and forth through the (H +) from Merak to Bakauhuni and vice versa.